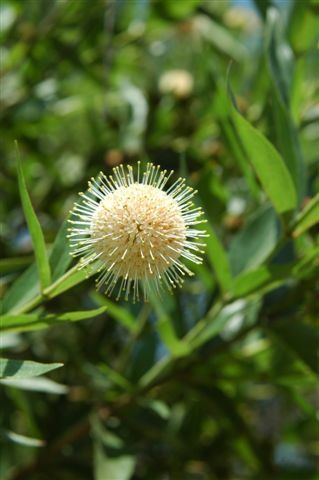 Common Names: Buttonbush, Common Buttonbush, Button Willow, Honeyball and Honeybells. USES: Attracts bees, butterflies, and waterfowl. 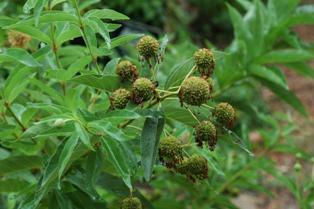 Leaffooted bugs like to be on this plant but don't seem to hurt it. PROBLEMS: Few other than hard to find in the nursery trade. Foliage is toxic and unpalletable to livestock. 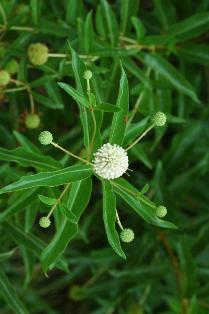 OTHER INFORMATION: Native Americans used buttonbush for a number of medicinal purposes. 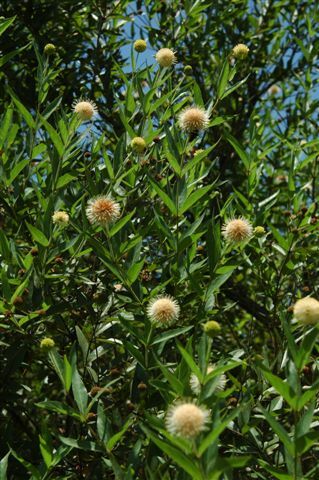 The root and bark were used to treat eye disorders, the bark was chewed to relieve toothaches and was boiled and used to treat headaches, dysentary, fevers, and stomaches.